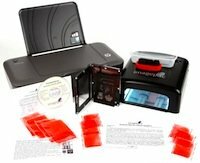 An Imagepac Stampmaker kit is a self-contained image printing system designed to produce stamps, stencils and embossing plates. Suitable for use with precious metal clay, polymer clay, scrapbooking, jewelry, cardmaking and other craft related activities. Using images from photos, books, art work, scanned images, original art or clip art the Imagepac kit will convert an image to a negative that is then used to make a polymer stamp from the negative. Images from your computer are printed on negative film by an inkjet or laser printer. A negative is clamped on top of a special polymer pac and placed in a UV light box where the image is transferred to the polymer pac. At the end of the process, a hardened stamp is produced, ready to be mounted on a stamp block. These kits are reputed to make highly detailed stamps and texture mats for both precious metal clay and polymer clay. The stamp making possibilities seem to be endless for many types of craft operations such as, scrapbooking, cardmaking, stamping and jewelry making. Check out information on compatible printers and Mac computers here. The embossing plates are capable of making fine plates of fingerprints (the current "hot" jewelry craze) or other detailed objects.